Last year, someone asked if I was doing anything special for National Tartan Day on April 6th. Quite frankly, I had not given it much thought, but since I was already involved in the planning of a weaving project it seemed logical to set a goal to finish the weaving by Tartan Day. I am a hand-loom tartan weaver who specializes in old, obscure Clan Grant tartans. During our visit to the Doune of Rothiemurchus, the Earl of Dysart, John Peter “Johnnie” Grant, 17th Laird of Rothiemurchus, DL, allowed us to photograph and document the two old tartans which have been in his family since the 18th century. Both plaids were almost certainly woven on his family’s estate. Both featured wide blue and green stripes on a field of scarlet. One was a symmetric sett (pattern); the other was unbalanced (repeating, but not symmetrical). My wife, our daughter, and I photographed the plaids and took precise measurements of each color bar in the sett. We measured the width and length of the plaids, tried to memorize the intensity or subtlety of the colors, the fineness of the yarns – all the aesthetic qualities that define the style, the character, the allure of a piece of cloth. In any event, when I learned that Tartan Day was looming (no pun intended) in the nottoo-distant future, I intensified my efforts to decide which tartan to reproduce. I had to dye the yarn, warp the loom and get started throwing the shuttles as quickly as possible. It takes a while to weave three yards – particularly as slowly as I weave! In my view, custom dyed colors are an absolute prerequisite for a unique piece of tartan goods. Commercial tartan weavers use the same old colors over-and-over-and-over until all setts start looking the same. My colors are never the same from one tartan to another. And that, of course, is the way it was in the 18th century. Why should it be any different today? Likewise, my patterns are never the same. Although scaled to match the original tartan, the actual repeat of the sett can vary from one project to another. (After all, I am 6’4” tall and the average height of a highlander at the battle of Culloden Moor in 1746 was 5’7”.) Each color bar is scaled exactly according to the original old tartan, but only occasionally will I weave a tartan the same size. For any hand-weavers out there, here are my specifications. I use a four-harness LeClerc loom, set up for a twill weave (1-2, 2-3, 3-4, 1-4). My yarn is 20/2 worsted wool, warped and woven at 36 yarn ends per inch. My colors are custom-dyed using combinations of standard RIT dyes. 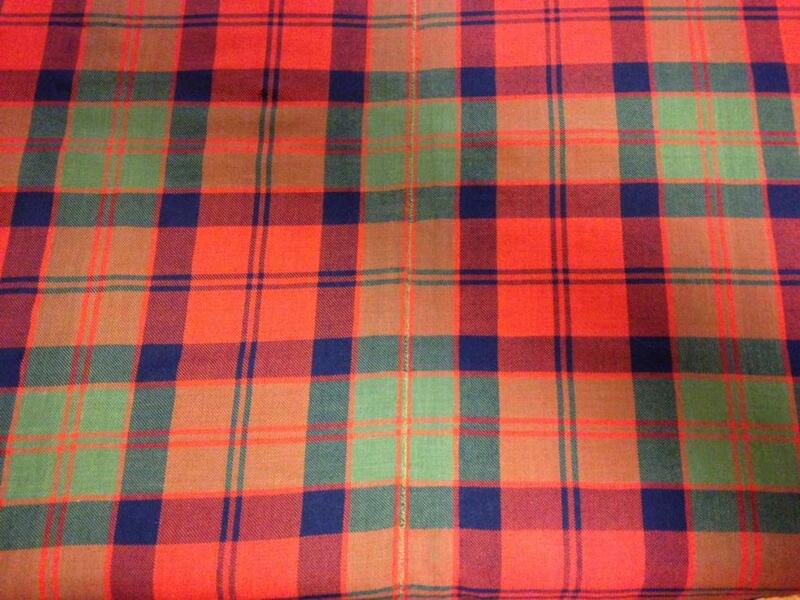 For example, my tartan scarlet is mixed one-half RIT color Scarlet and one-half color Sunshine Orange. The subtlety or intensity of the color is determined by the amount of water used and the length of time in the dye bath. Tartan green is a combination of Kelly Green and Lemon Yellow, etc. My yarn supplier already has an exact off-the-shelf purplish-blue which is ideal for the dark blue in Grant tartans. The two photographic images below illustrate the original 18th century Grant tartan from Rothiemurchus, monogrammed “PG” for Patrick Grant, compared with my reproduction woven in the spring of 2014. If you look closely, you will see where my plaid is joined and stitched at the center. But don’t look too closely!